The Executive Committee of the National Economic Council (ECNEC) on Sunday unanimously adopted a thanksgiving motion congratulating the Tigers for clinching the three-match ODI series victory over West Indies by 2-1 on their soil. 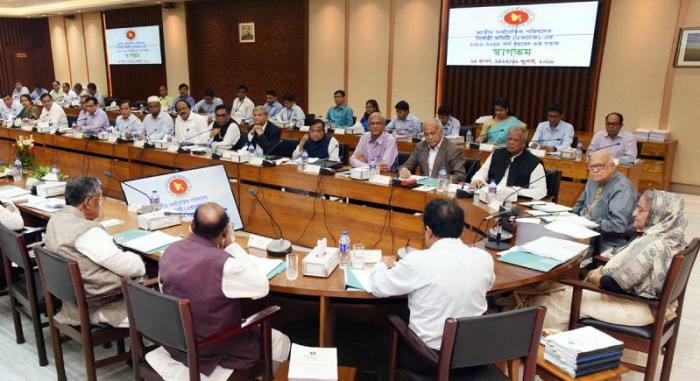 According to a planning ministry press release, ECNEC Chairperson and Prime Minister Sheikh Hasina presided over the meeting held in ECNEC conference room in the city’s Sher-e-Bangla Nagar. Planning Minister AHM Mustafa Kamal moved the proposal at the meeting. Bangladesh clinched the ODI series against West Indies yesterday by winning the last match by 18 runs at Basseterre in West Indies. In the thanksgiving motion, the planning minister congratulated the national cricket team through the prime minister and on behalf of the cricket loving people of the country for attaining this historic feat. He also extended his heartfelt thanks to the prime minister as the national cricket team created history in the West Indies yesterday. The motion said series win against West Indies on their soil had always been a tough task and after 2009, Bangladesh again clinched the ODI series over West Indies this time and both this happy moments came under the tenure of Awami League government headed by Prime Minister Sheikh Hasina. The planning minister in the motion also hoped that Bangladesh would be able to gain much more successes in the coming days in all fields including the sporting arena.